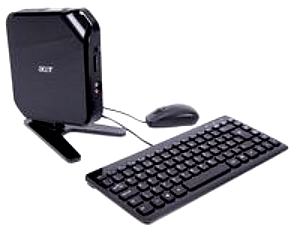 Acer Aspire Revo R3700 Desktop – first impressions and real world review | Really useful stuff that I bump into…..
©Woody – please link to this page only – as no part to be reproduced without permission of the author. I guess that I am one of the first folk in the UK to have purchased an Acer Aspire Revo R3700 from Ebuyer. Ebuyer say that it is “exclusive” to them – but I suspect that is “exclusive” because the spec of the PC they sell, differs from the US spec in that it has a 160GB HD (as opposed to 250GB on the US version) and comes with Limpus Linux pre-loaded (more on that later). Otherwise this is the standard Revo 3700 with the new ION2 graphics, 2GB of DDR3 and an Intel Atom D525 running at 1.8GHz. What does it look like – and what do you get in the box? Visually, the main unit is quite stunning in a very glossy piano black – the same sort of finish as Samsung/LG TV’s – so this wouldn’t look out of place beside one. Handy if you were thinking of using it as a Media Centre PC – which I guess a lot of folk will buy it for. In fact, given that it has optical sound out (SPDIF) – this makes it even more suitable for those who would plumb the pure digital output into an AV amplifier to go for the full Dolby surround sound etc. 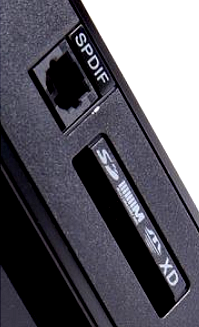 (The only problem is, that as you can see, the SPDIF is on the front of the unit – rather than the rear – Doh!). 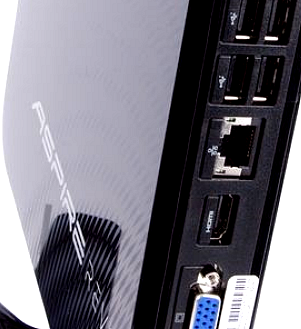 Video output is also catered for with a standard VGA socket and HDMI. Note also, the Multi card reader handily positioned on the front of the unit (where you need it) which supports MultiMediaCard (MMC), Secure Digital (SD) Card, xD-Picture Card and Memory Stick. Included in the box (and very well packed and sealed to avoid scratches) is a matching keyboard and optical mouse and a VESA bracket that will allow you to mount the Revo onto the rear of Monitors and TV’s – which have the necessary fitting (most modern models come with this these days). At first, the keyboard does seem a bit of a disappointment. It is quite thin and light – and a lot smaller than it would appear from photographs. The keys also look like a luxury version of what you would find on the Sinclair ZX Spectrum (that dates me ….). However, when actually being used, I found nothing to complain about. I guess that if you are a touch typist (I am not) or are writing a book, then you might want something more upmarket – but it does the job. Included in the box is a small laptop like external power brick and some paperwork/manuals – but I didn’t read them – who does? On first power up of the Revo, you can access the BIOS by hitting the Delete button – and F12 changes the boot order. All standard fare – and nothing worth mentioning. I did have a stroll through the BIOS, but found nothing worth tweaking (I have seen discussions that similar models have a BIOS setting that allows you to change the amount of memory reserved for the Graphics – but I couldn’t find it). As I mentioned previously, this Revo comes pre-loaded with an Acer configured version of Linpus Linux. The less said about that, the better …. I did give it a whirl, but as it lacked any capability (that I could find) to change the screen resolution from a default 800 x 600, I gave up on it. Yes, there is a resolution changing applet – but it did zip. If you have a beard (that you take to stroking) I guess you might linger longer over this challenge, but I have a life – and more importantly, an impatient Mother – for whom this PC is ultimately destined as a general purpose Silver Surfing board…. To cut a long story short, I loaded up as little as possible to make this a working PC and the least likely to confuse (my Mum). So, I installed Windows 7 Ultimate X64 (yes, I know it is a bit over the top, but I already had a copy and who knows, one day we might take it up to 4GB – so might as well future proof). On top of all that I put Avast (the free version), Office 2010 professional, Live Essentials 2011, MyDefrag 4.3, Process Explorer, PDF-Xchange Lite, FireFox 3.6, IE9 Preview 7, Adobe FlashPlayer (in order to run BBC iPlayer) and AutoRuns – the later turned out to be particularly useful in that I was able to spot that one of the above had silently installed the Ask toolbar – grrrrrrr. Like the clappers. It took everything I could throw at it in it’s stride and I never felt that I had an underpowered PC – quite the opposite. CPU use seemed to amble along at less than 20% utilisation most of the time – in fact, it spent most of its time in single figures. The detailed performance data follows at the end, but it is worth mentioning that I downloaded some 1080P AVI’s from the HighDef Forum and they played in Windows Media Player 12 without missing a frame (as far as I could see) and at no increase in overall CPU usage – testament to the CUDA offloading to the ION2 GPU (this means that the ION Graphics chip was doing the processing instead of the Atom CPU). Oh – and although it has a fan – which vents through vents on the top – I never heard it once. The keyboard is a bit tacky, but otherwise this is a very nice and nippy PC – which I would be more than happy to use on a daily basis or as a dedicated Media Centre. Previous PostThe best ever “To Do List” / “Get Things Done” / GTD tool?Next PostThe best (and cheapest) UK Internet (broadband/ADSL/ISP)? Just spotted one of these on ebuyer and was curious to see what other people though of it. Acer Revo’s are especially to tell the difference between, so i had no idea if it was an old or relatively new model. Seems like quite a speedy machine for the price tag and of course the size. Does audio go over HDMI aswell as video? I bought one some weeks back with a different configuration – 4GB ram, 320GB HDD, pre-loaded with Win 7 Home Premium 64bit with a wireless keyboard and mouse bundled in, along with speakers, webcam and microphone. It’s a great little machine given the modest price tag. No problems handling 720p videos (i’ve yet to venture beyond that) and most daily tasks. Nice real world review. Only thing missing is the idle and load power consumptions. I don’t suppose you have a Kill-A-Watt or similar meter? Hi. I’ve just bought one of these PCs and I’m having a big problem. I also installed Windows 7 Ultimate X64, and it takes 10 minutes to boot (more or less). If I start on Safe Mode, it also happens the same. It stops on CLASSPNP.SYS, but after doing a research, looks like it’s stucked in the next driver, CDROM.SYS. How did you install Windows 7? I tried with USB and external CDROM. Does anyone have any suggestion to solve it? I install Win 7 32Bit version for this one, and it works perfectly. Boot up only need less 1 minutes. I had this on a Acer one. Basicly your hard drive is nearly dead. Get another one and clone the old one onto that. Swap and Bob should be your uncle. 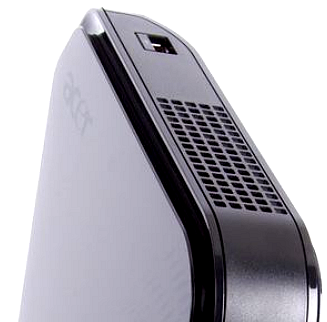 Pingback: Asus 1005P Seashell – mini review, how to upgrade memory (to 2GB), install Windows 7 ultimate and related Top Tips! « Really useful stuff that I bump into…..
Pingback: 2010 in review « Really useful stuff that I bump into…..
It’s smooth when running win 7. Now that is interesting. It seems that folk loading X64 Windows 7 on this are having the problems – yet 32 bit is speedy. You are not using Avast Anti Virus are you? It’s just that I recall now that I had a problem installing Office 2010 (32bit). The install always came up with an error until I temporarily disabled Avast. Other than that, I have read comments in other forums that the very latest ION2 X64 drivers are poor and cause hangs. You could always delete the video device, say “yes” to also deleting the drivers and then re-scan and let Windows fond the correct driver on Windows update. i’m thinkinh of buying the acer aspire revo R3700, i want to replace my old laptop with this and a monitor as i work from home. i will be running windows 7 32 bit and i will need to add photoshop CS5, sage accounts and microsoft office (work,excel etc) do you think the little acer can cope with this ? also will need to add a cd drive. also where is the best place to buy from, ebuyer.com looks good. 1. You don’t mention if the OS or PC doesn’t recognise the 4GB. If it is the PC, then you have the wrong memory or there is a BIOS swithc or something. If you mean the OS doesn’t recognise it – that is because you need to be running a 64bit version of Windows in order to recognise 4GB and upwards (well, realistically, anything over 3GB if we are being pedantic). 2. Install Process Explorer: http://technet.microsoft.com/en-gb/sysinternals/bb896653 this will tell you if something is maxing out the CPU – or if you have a massive number of interupts. If the later, then unplug all peripherals – because one of them is not palying nicely or is using the wrong driver. I was thinking of getting one of these. How does it handle BBC iPlayer HD content? I know the specs should cope with it, but from past experience iPlayer doesn’t behave like standard Flash HD video. Any feedback gratefully received. Good question! Apologies for not thinking to cover this. I can tell you that, yes, it does handle BBC iPlayer in HD absolutely fine – and with no missed frames that I can tell. I wasn’t able to test this originally (when I wrote the review) as my own broadband doesn’t have sufficient bandwidth for iPlayer in HD. However, my Mum does – and I tested it when I installed it for her. tbh im a bit disappointed with those win7 benchmark numbers. i got the first revo, with the single core atom 320 and first ion generation and the difference is not that big. r3700s cpu has 1,3 points more. that should be noticeable differnece in speed but is it worth upgrading? i don’t think so since the rest stays almost the same. especially the ion2 chip is really disapointing. Yes, I agree with you. My review and others would seem to concur that there is not much improvement between this the single core Atom and original ION and this dual core with ION2. Not enough (in my opinion) to make it worth upgrading to from an older version – but as a brand new purchase, I don’t think that you can go far wrong. I also note that ebuyer have just brought the price back down to £229 – so it’s not a bad deal. Thanks for the prompt reply Woody. I’ll try process explorer tonight, I’m running win 7 64bit with only a bluetooth dongle and usb dvd writer plugged in both appear ok.
alright guys , ive tried watching the hd programmes on bbciplayer and they seem to judder ive heard there a download or somethink to stop this ? has anyone done this download….? 1. Adobe Flash – make sure you download the latest for the browser you are using. 2. Network bandwith: iPlayer HD normally needs a good 4MB (or more) broadband connection – and if yours isn’t good enough, you will have juddering. You can test this yourself by doing a speedtest at speedtest.net. Been meaning to post something for quite awhile but work, kids, sleep (in no particular order :)) always got their first…..you know how it is. We had mulled for a year or so about a digital picture frame, but never got round to it……then moved my attention to media PC….My requirement was primarily to have a PC that I could use to watch the family photos/films and play my music. 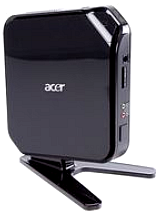 After pondering for quite awhile I finally plumping for the Acer Revo 3700 in December last year (Santa came early :)). The spec I went for was the 500GB Disk/4GB RAM one. The fixing bracket that came with it is not compatible with a 40″ TV…….not that fussed as I prefer is free standing. The wireless mouse and wireless keyboard is not bad to be honest, not the best obviously on the market…but it certainly does the job. I had one small issue was the resolution, it defaults to 1920 x 1080, but this over stretched the wallpaper beyond the boundaries of the TV screen. But going to the TV settings via the TV remote you can fix the issue easily by going through the Setup and Screen Settings and setting the Display Area to ‘Full Pixel’ and job done 1920 x 1080 displaying perfectly. Watched some TV through MSN, BBC HD iPlayer – again no complaints. I’m not a gamer, so I can’t provide any feedback for the performance I’m afraid. Next stage was to have network connectivity between the Revo and my old XP Dell upstairs in my office. Purchased some Devolo HomePlugs http://www.currys.co.uk/gbuk/devolo-dlan-highspeed-ii-homeplug-network-kit-03323575-pdt.html tried these for quite awhile. Internet browsing/viewing iPlayer worked fine, but data transfer between Dell and Revo was slow….1GB of data took around 30mins…..tried the HomePlugs in different setups, seperate plugs, no extensions, speed/duplex settings etc with no improvement. I had one eye on the refund period, so eventually gave up and returned them. Whilst I had the electrician round putting additional double sockets ready for a new desk http://www.posturite.co.uk/PosturiteSite/product/090415211.htm I had a nose through his van for some CAT5…..stumbled on some CAT5e and so whilst he was there he channeled two lengths from my office to the lounge, and now 1GB takes under 2 mins….. hey-hey! What an excellently crafted and constructive comment. Really appreciate it – as I am sure will our readers (this article is still getting over 50 unique readers a day). Great that you put those links in – thanks, so useful. Wireless keyboard and mouse? Wow, I lucked out on that then – as the Keyboard/Mouse on the 3700 (I got for my Mum) is definately wired! Weird that you had the problem with the Devolo’s – they have quite a good reputation. Now you have the Cat5e in – great if you are doing point-to-point but if you want to add other devices to the home network, don’t fall into the trap I did – and used the built in switch on the broadband router. Took me quite a bit of testing before I discovered whch component had slowed things down…. Went and got one of these: – £12.99 of a 1Gig 5 port Switch – and now everything goes like the clappers! …ah the mouse you reminded of something else, nothing crazy but worth adding……The USB dongle for the mouse is hidden in the battery compartment….so if you anyone has issues getting their wireless mouse working, then pop the battery compartment and grab the small USB dongle and whack it one of the USB ports in the Revo. Ahh you must have read my future plans 🙂 I was going to use an old Linksys router but that TP-Link switch looks just the job, at a £13 – a bargain! Will definitely be getting one of those when I get the NAS…. I got one of these a couple of months ago and installed Win 7 (32bit Home Premium I think). All software is up-to-date and latest flash player is installed. No matter what I do, I cannot get BBC iPlayer HD content to play smoothly – it judders constantly even when the content has been pre-downloaded via the iPlayer desktop app. I see that other users can play HD content no problem – is this still the case? Any help / pointers much appreciated! When I first got mine, (2GB, Win 7) it coped pretty well with iPlayer HD, but recently the picture has been juddery as you describe. I think the the way the BBC encode their Flash video is peculiar. Adobe brought this to their attention some time ago, and quality improved subsequently but now seems to have returned to the bad old days. The BBC seem to be actively discouraging the use of lower spec equipment to view iPlayer content unless it has an Apple badge on it! I have had best results using XBMC software with a third party iPlayer Add-on. This is what I used years ago and it worked perfectly on lower spec gear until the BBC made changes which caused it to fail. It is now back up and running and though it takes a little bit of effort to set up, the results are worth it. Do a search on XBMC iPlayer and you’ll find some helpful sites. Perhaps one day the Beeb will ditch the resource hungry Flash or at least get the HD working as well as it does on YouTube but I’m not holding my breath. I have just had word from another suffer of this problem – who have finally got a response from teh BBC to say that they acknowledge the problem and are working with one of their suppliers to put it right. OK, so it is not a fix – but at least it is going in the right direction! kat …….the stand is detachable yup. first let me say this is the most useful information i’ve found about the revo and i’ve looked at everything. i’m looking to buy one for the wife her only requirment other than small and silent is it needs to run 2 monitors, i see it has vga+hdmi but can you use both at the same time ? I have a aspire r3700 and am having a huge problem – I cannot get sound through the HDMI cable to the TV.In the Control panel, In the sound options I am showing 2 devices – Headphones (unconnected) and Digital output SPDIF. The SPDF has the moving green bars indicating that there is sound being produced. I have tried getting the latest drivers from the Acer site, and the Realtek site – to no avail . . .. any thoughts? Have you been to the nVidia site and downloaded their latest drivers? The HDMI sound support is included within their (rather large) download package. Top tip, many thanks – now works perfectly. Woody – any thoughts on the Acer Revo One RL85 4TB i3 Nettop ?